Does iCloud Backup Safari History? How to View Them? Being able to easily access your browsing history on the Safari browser is one way to keep track of the websites you visited and also gives you an easy way to access the websites again. When you sign up to iCloud as a backup solution, you get up to 5GB of free storage that can be used to backup all types of data including photo, messages, videos and purchase history for music, movies, TV shows, books and apps. It is however not clear whether you can back up your Safari History on iCloud. It is not included in the official Apple line-up of data that can be backed up to iCloud. Can You Backup Safari History on iCloud? As we have already seen, it is not clear whether you can backup Safari history to iCloud. Apple describes the data you can backup to iCloud and Safari history isn't one of them. But when we access the iCloud backup using an iCloud backup viewer, we found iCloud do backup Safari history as well. The following is a simple step by step formula to backup safari bookmarks on iCloud. Step 1: On your iPhone or iPad, tap on the settings app. Step 2: Tap on iCloud and then turn on "Safari". The next time when your device automatically backs up to iCloud, Safari bookmarks and even history will be backed up along with your other device data to iCloud. With a third-part tool like iMyFone D-Back for Win or iMyFone D-Back for Mac you can easily view the existing and deleted Safari history in iCloud. This iPhone data recovery tool makes it easy for users to gain access to an iCloud backup and view or even extract various types of data including Safari History. Some of its features include the following. 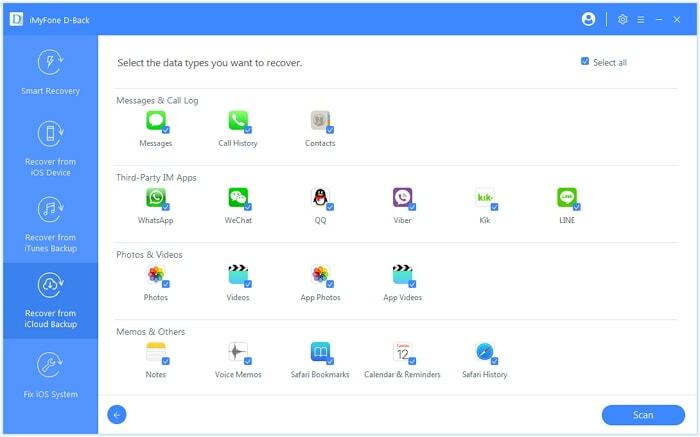 It is useful in the extraction or recovery of up to 22 different types of data including Safari history, videos, messages, photos, contacts, WhatsApp messages, Kik messages, Viber messages and more. It can be used to extract data from iOS device, iCloud and iTunes backup files. 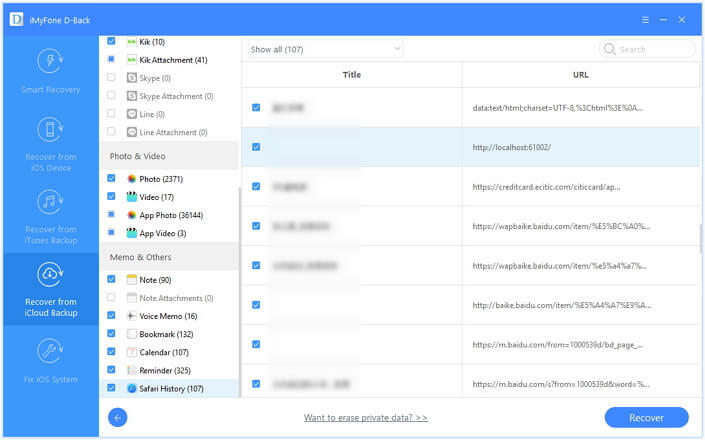 It has a preview function that allows users to choose the data they want to recover. 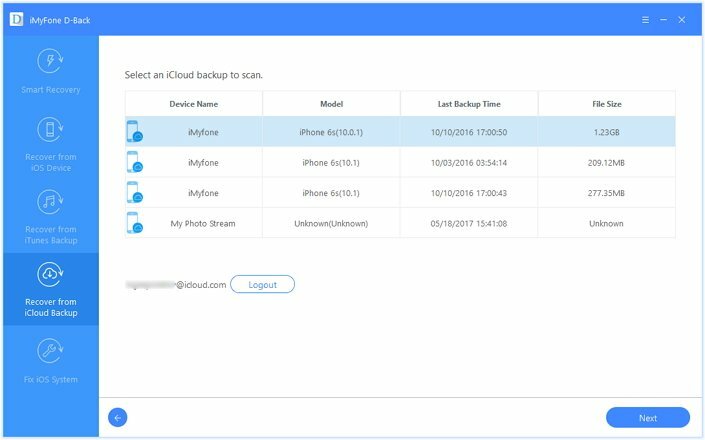 It works for iCloud backups made on different iOS version, including the latest iOS 12/11. 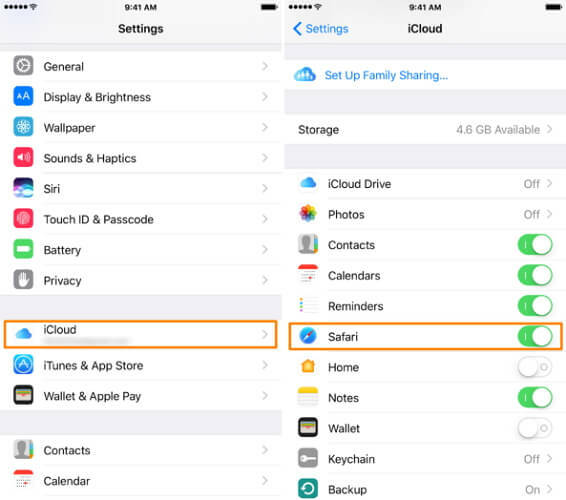 Follow these simple steps to use iMyFone D-Back to view Safari history in iCloud. Step 1: Open the program on your computer and then select "Recover from iCloud Backup." Click "Start" to begin. Step 2: Sign in to your iCloud account and then select the relevant iCloud backup. Click "Next". In the next window select "Safari History " and then click "Scan". The program will begin downloading and scanning the selected backup. Step 3: Once the process is complete, all history will be displayed on the next window. Select the ones you want and you can click "Recover" to save them to your computer. You can use this tool for your devices running iOS 12.